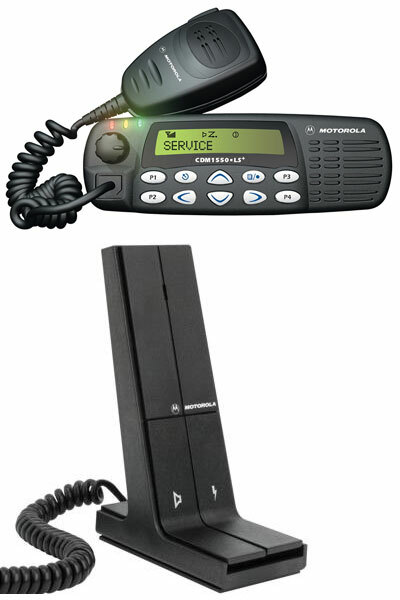 You can have X-Pand and all the advantages of a Motorola Repeater with the GR-1225. With 16 programmable channels, you can talk on either a 25 or a 12.5 kHz channel allowing a seamless, economical transition to the narrower bandwidth. Two-way users won't want to be without this greatly expanded audio quality at 12.5 kHz. Compact Styling - The GR1225 accommodates a built-in power supply as well as numerous internally housed accessories such as a duplexer, battery revert and an enhanced controller. Adjustable Power - Each channel can be programmed to either 25 or 45 (UHF) or 25 or 50 (VHF) watts to meet various coverage needs. 2-Character Numeric LED Display - Green light illuminates the channel that's in use. Battery Back-Up Tone - When the battery revert kit is installed, it alerts users that they are operating on the back-up battery supply. Time-Out Timer - Programmable from 1-255 seconds, this feature prevents a group from monopolizing the repeater with a single transmission. Repeater Enable/Disable - Temporarily enables or disables repeater operation from the front panel to allow use as a base station for dispatch operation. CWID (Continuous Wave Identification) - Continuous Wave Identification uses Morse code to automatically send out the station ID to identify the transmitting repeater. Courtesy Beep - This programmable alert indicates when a person is through talking so that other users are free to respond. Programmable Relay Delay - This “hangtime” keeps the repeater transmitter keyed from 0 to 7 seconds after the radio user releases the Push-to talk switch to enable other users to respond without having to re-activate the repeater. AdvantagePort Expandability - Allow an authorized dealer to add an Advantage Board to upgrade the repeater functionality. A Two Way Radio Repeater is an excellent device that receives a two way radio signal and re- transmits the message at a higher power which increased range and coverage of two way radios. Substantially increases broadcast and reception area, adding miles of range to your coverage. Ideal for: Large Events, Construction, Manufacturing, Transportation, and Utilities. 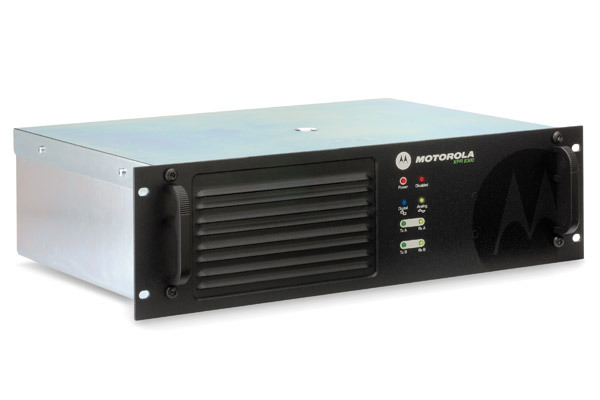 Maximize the performance of your MotoTurbo system with the XPR 8300 repeater. Available in UHF and VHF frequency bands, the XPR-8300 utilizes dynamic mixed mode capability to ease migration by automatically switch between analog and digital mode. XPR 8300 supports two simultaneous voice or data paths in digital mode, doubling capacity without additional equipment. Can be configured to use both Digital and Analog frequencies. PlusWith extended coverage and expanded voice and data capability, this multi-site digital trunking solution enables you to accommodate the high volume, wide area communication that’s required to keep your mobile work teams connected. PlusA scalable, single-site trunking solution that enables over a thousand radio users to share business-critical voice and data communication on the same system. 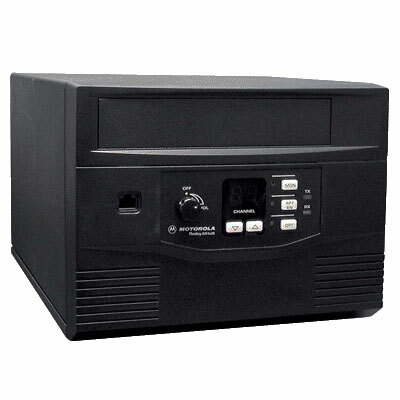 Runs 100% continuous full-duty cycle at 40 W. TDMA digital audio capability Time-division mulitple-access (TDMA) provides twice the calling capacity for the price of one license. A Two Way Radio Repeater is an excellent devise that receives a two way radio signal and re- transmits the message at a higher power which increased range and coverage of two way radios. Substantially increases broadcast and reception area, adding miles of range to your coverage. With a versatile 32 channels, powerful 4-watt speaker and alphanumeric display, the mobile base station’s two-way radio lets users concentrate on the road. Four programmable buttons accommodate up to eight features, such as two-channel home revert, Escalert and phone mode. We can add a desktop microphone and turn this into a desktop base station. Can be outfitted with hand or desktop microphones (both depending on need). Integrated, efficient, reliable communication is more critical to operational performance than ever before. Organizations and Events whose workers must be mobile need a communication solution that makes it easy and affordable for them to stay in touch. Motorola MotoTurbo delivers just that, it combines exceptional two-way radio functionality with digital technology to deliver increased capacity and spectrum efficiency, integrated data communications and enhanced voice communications. 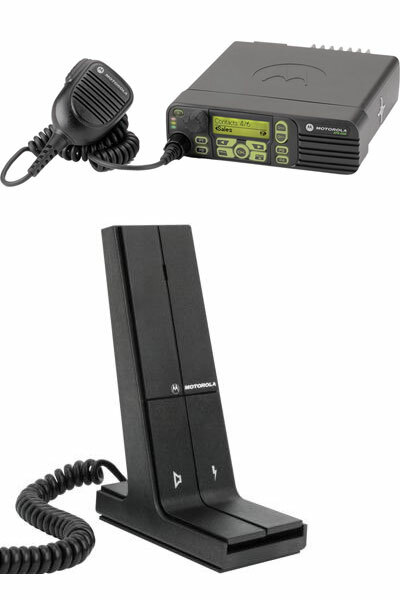 This digital mobile radio/base station can be outfitted with a desktop microphone to turn it into a desktop base station. Multi-colored LED indicators for clear, visible feedback of calling, scanning and monitoring features. Large, easy to use volume knob. XPR-4550 includes integrated GPS modem. Powerful, front-projecting speaker that transmits 12.5 kHz digital TDMA audio or 12.5/25 kHz analog audio. Flexible, menu-driven interface with user-friendly icons or two lines of text for ease of reading text messages and navigating through the menus. Four programmable/replaceable buttons for easy access to favorite features. New features such as one-touch calling and text messaging are amade even easier through programmable button access.